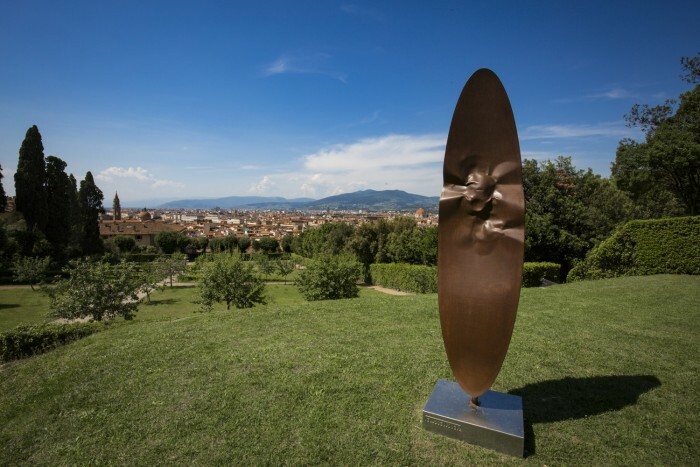 Shiny new works of contemporary art have once again “invaded” the Boboli Gardens in an appealing summer exhibition. 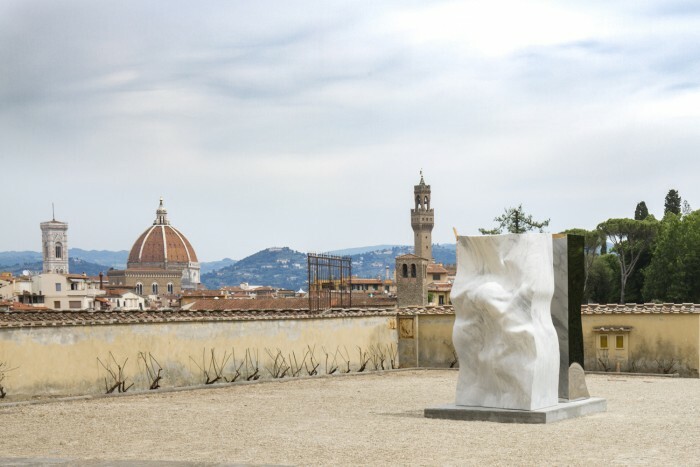 “In Ordine Sparso” sees thirteen works by sculptor Helidon Xhixha explore the ideas of chaos and order within Florence’s historic spaces. It runs from June 27 to October 29 2017. The Albanian-origin Xhixha, now living and working between Milan and Dubai, was born into a family of artists and learned sculpting from his father at a young age. He has achieved continued success for his now iconic stainless steel structures, polished to a mirror. 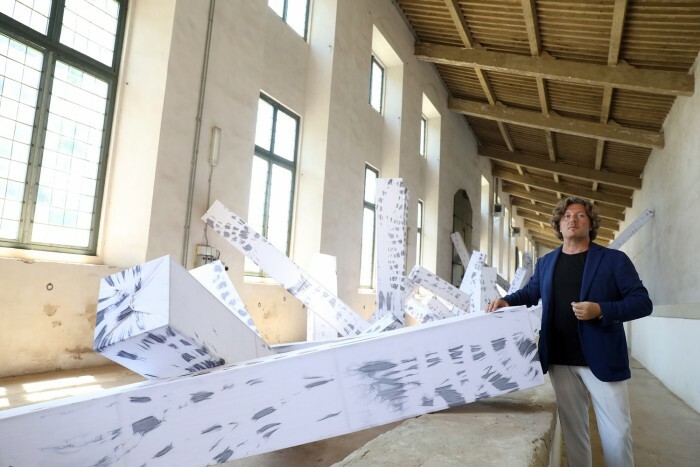 He is perhaps best known for his Iceberg sculpture installed in the Grand Canal during the Venice Biennale 2015, which tackles the subject of climate change. In 2016, the artists was selected to take over the central courtyard of Somerset House during the inaugural London Design Biennale; his Public Award-winning installation there, Bliss, focused on the issues of migration and displacement. The next big step for the artist has been to have been invited by the director of the Uffizi, Eike Schmidt, to hold a retrospective in Florence. Works are mostly in the Boboli Gardens, with one in front of the downtown ex-courtyard (a kind of teaser to bring you over to the other side of the Arno?!). Put into dialogue with the historic spaces, and exploring the themes of chaos and order, the artist has taken his inspiration from nature and the principles of the sacred geometry. Some works were made specifically on this occasion. We’re welcomed to the exhibit already in piazza Pitti, where Xhixha presents Conoscenza and Infinito. These works are inspired by natural mathematical principles like the Golden Ratio, and are intended to remind us of the fundamental concepts of order, balance and regularity. 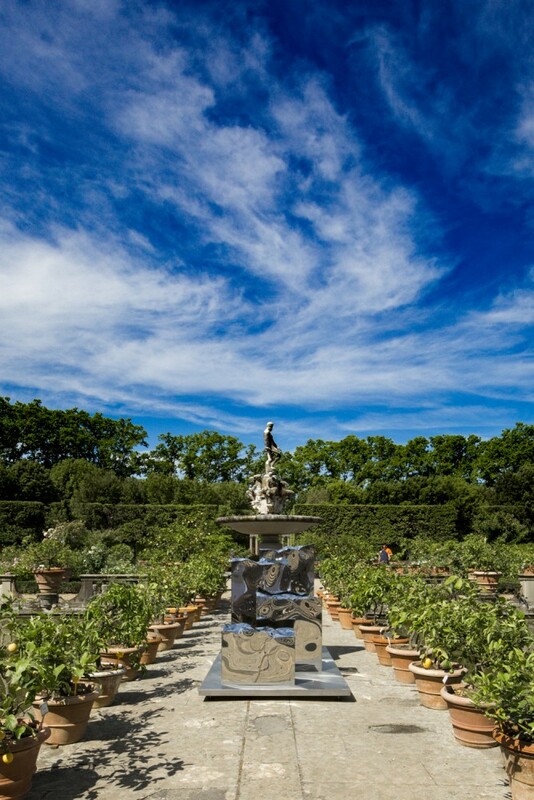 In the Limonaia of the Boboli Gardens the artist has looked to nature to understand chaos. Inspired by the Crystal Caves in Naica, Mexico, Xhixha has designed a complex response to their seemingly random formation. 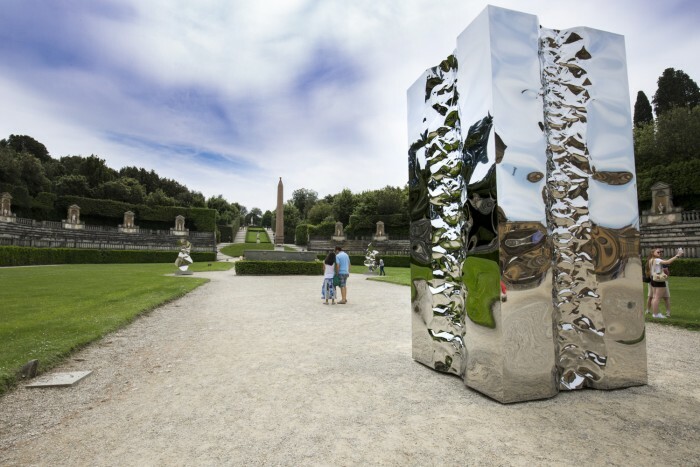 His signature aesthetic response in the Limonaia, great towering columns of mirror-polished stainless steel that look like crystals growing out of the historic structure, entices the visitor to enter and explore the artist’s vision. Through their shapes and reflective surfaces (though not always – some works are in bronze! 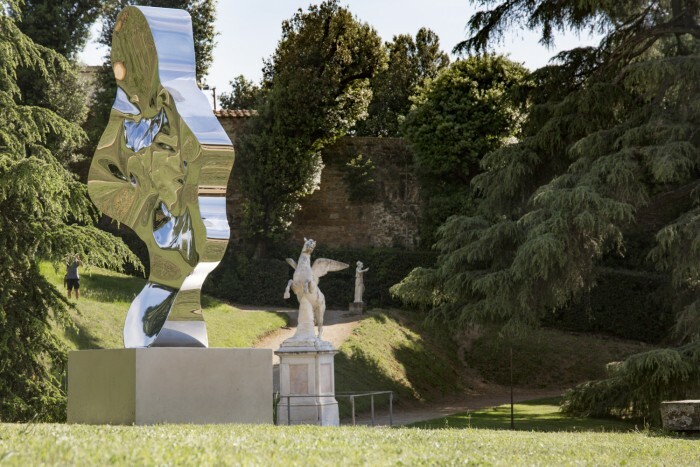 ), the thirteen sculptural installations by Helidon Xhixha offer new perspectives on the intertwining of art and nature, a theme of great interest to the Medici in 16th and 17th centuries and that still continues to fascinate all of us today.